PROFESSIONALLY DECORATED & COMPLETELY UPGRADED - WONDERFUL SUNNY FAIRWAY & MOUNTAIN VIEWS! STUNNING VIEWS & PRISTINE CLEAN 2 BEDROOM, 2 BATH PLUS DEN WITH SOFA-BED Prime, interior location with sunny eastern views overlooking the South 2nd fairway. This desirable Monterey Country Club condominium is absolutely stunning and rich with ambiance! Tastefully decorated throughout in contemporary furnishings this home offers comfort, style and lots of room for the entire family to spread out. The spacious great room is beautifully decorated and well appointed with a sectional sofa and chairs, a large cable television and gas fireplace. Seating for six at the spectacular dining room table. The den/bonus room has a cable TV and large skylight providing sunshine and the perfect reading light. There is a king size bed in both the master bedroom and guest bedroom with luxurious bedding. This property provides enough space to comfortably sleep four with room for one or two occasional guests in the den. The master bedroom has cable television and an updated private bath with walk-in shower. If you like to cook, you will love the kitchen. Upgraded with stainless steel appliances and a gas stove. The kitchen is very well supplied and is fully equipped for entertaining. There is a lovely breakfast area in the kitchen with pub table and seating for two. The extended back patio offers the best in indoor/outdoor living. Furnished with a barbecue for the outdoor chef and beautiful dining and lounging furniture. 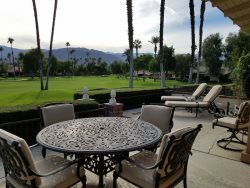 With stunning views and an eastern exposure it is the perfect spot to enjoy your coffee in the morning sun or an evening BBQ while watching the golfers play through. The pool and spa are a short walk away … about two buildings. This lovely vacation home is pristine clean and has been meticulously maintained and cared for, and it shows. No detail has been overlooked and no expense spared in providing a beautiful and comfortable get-away for vacationing guests. This is “Home Away From Home,” a property you will want to come back to again and again. The owner’s are looking for guests who will love their desert home as much as they do. Sorry no pets. Monterey is a private country club. Please inquire about restrictions on golf, tennis and fitness center. Two Week Minimum Please. Wireless Internet connection is available as well as free local and long distance U.S. and Canada calling. The members of the team are always very friendly and if we require any services it is done immediately. This allows us to enjoy our holiday and not have to worry about a thing. We thoroughly enjoy our stay at this and other properties we have stayed at in our six years. We can enter the properties and everything is there that we need and we feel right at home the minute we enter the unit. We have been with Vacation Rentals for 5 years now and we are very impressed with the staff. They are always very courteous and requests or problems are dealt with very expediently in a very professional manner.We are always amazed at how fast the maintenance people come and fix or replace any time we have had an issue with something in the condo, which is very rare. The maintenance people are always very friendly and respectful. We have loved every property that we have stayed in with Vacation Rentals. Any problems we have had were dealt with and they weren't anything that would impede are staying in the property itself. The housekeeping is always top notch and the properties are more than adequately equipped to make our stay comfortable and relaxing.